Do winter activities that are fun. Weather that adults consider being “messy” can be a huge canvas for children and their imaginations. 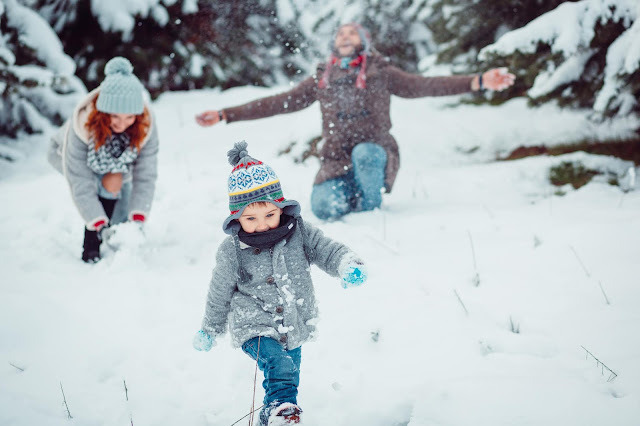 Snowballs, snow forts, and trees covered in snow offer a wealth of opportunities for children to explore and experiment in our living landscapes. Encourage exploration. Ask your child to look at how the landscape changes with the seasons. Talk about what happens after leaves fall, when snow arrives, when it’s windy, and more, linking these seasonable changes with basic science about clouds, rainfall, temperature changes, and the earth. Play with them. Get outside in the winter with your children. It’s healthy for both kids and adults to move! Have a snowball fight, build a snowman or fort, or go sledding. Process what they did. Ask kids to share what they did outdoors. You can ask them to talk, write, or draw out their activities and observations. Did they observe something new? Did something surprise them? What was fun?